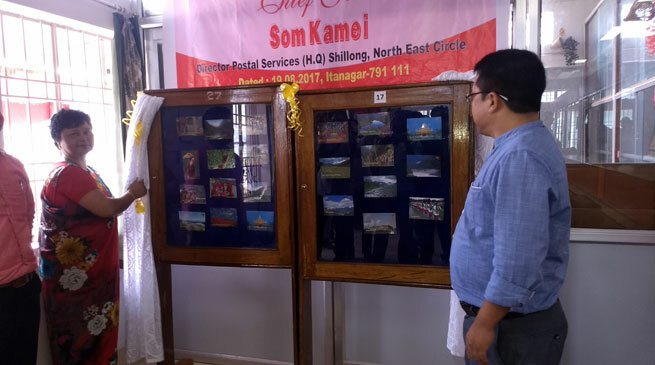 In a unique attempt to boost state tourism to outside world, The Director, North East Postal Services (HQ), N. E Circle, Som Kemei on Saturday has formally released 21 postcards, with each portraying state best tourist destinations, rich culture and customs of indeginious people in a small function held today at head office postal department, Bank tinali, Itanagar. The idea behind introducing these new postcards is solely to promote rich culture and mesmerizing landscape that adorn border state Arunachal to outside world, disclosed Kamei while unveiling the postcards amidst staffers and media persons. Mentioning that effort has been proved helpful in few northeastern states, Semei said that the initiative was taken up jointly by department of post with state tourism department to make this land locked state more of an eye candy in the eyes of tourists. These post card will be made available in all Branches of post offices and each postcard will cost not more than 5 ruppees and one can buy pack of these 21 postcards investing only ruppees 105, he disclosed. Furthermore disclosing that postal department will soon going to introduce a new bank called *India Post Payment Bank (IPPB)* in every district post office, Semei said department is looking forward to open branches of IPPB in all district headquarters with its head office in state capital. Expecting full support from masses in popularalising the move. , Semei said for first phase few districts like Pasighat, Changlang, Aalo etc were picked among 21 districts where masses can avail all facilities of IPPB like core banking, easy money transactions, postal services and savings bank accounts etc. “The first phase will be done within this financial year and when the process will completely achieved then all 250 post offices and 50 sub offices in the state will be networked with rest of post offices in the country. The initiative is a part of Digital India vision and taken up by postal department to provide easy assesiblity and door step banking services in remote parts of the state. We are hopepul that the endeveor will proved boon for those people living in far flung areas, where there is no banks , Semei further added.